I'm still scouring the store shelves for new B&J's, H-D Trio, and even Hostess ice creams that are headed for convenience stores (and Dollar General), but we need to keep rolling for now. Chick-fil-A has slowly been expanding in my area and I finally decided to try them out for lunch. I know that I'm not breaking any new ground here, though I do wonder how many of you stop there from time to time. The fact they cook everything in peanut oil has always made me nervous but unlike 5 Guys or Texas Roadhouse, at least their locations aren't covered in peanut shells. 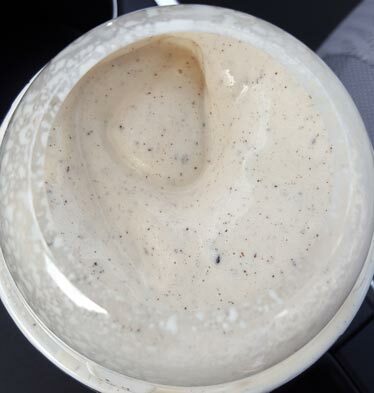 For $2.16, I added this large Cookies and Cream milkshake to my order. Had I known how thick and heavy this shake was, I probably would have gotten the smaller size instead (590 cals vs 750 cals). They were still advertising their peppermint chocolate chip shake from the holidays but I couldn't change my mind once I saw that they were offering up C&C shakes. Overall I'd say it's a pretty good shake, especially for a fast food joint. It's got a decent cookie wafer vibe but it's the cookie cream filling flavor that is most prevalent. I don't know if it's coming from the base vanilla ice dream or if they've added something to the mix to make it more potent. If I had my way, I'd prefer the wafer (cocoa-ish) flavor to be stronger to give this shake a better balance. While the shake was much thicker than expected, the use of their "ice dream" does give this shake an air of frozen dairy dessert to it. There's just something with the way it breaks down. There's kind of a watery-ness to it. I'm not saying it's terrible, but this is no standard ice cream shake either. To put it another way, I can't imagine getting this shake by itself. You need the salt and other flavor highlights from your meal to break up that bit of wonk that comes with an ice dream base. Other thoughts: Eat your fries quickly before they cool and become rubbery (this does't take long). I went with their regular chicken sandwich meal and I had forgotten that it only comes with pickles, nothing else. I do like the real chew of the chicken. It's nice to bite in to real chicken and not some processed chicken form chunk. The bun was pretty boring. I'll go back at some point and either try the grilled chicken club or maybe the grilled chicken cool wrap. Maybe I'll go on a nice hot day and get one of those sandwiches with the frozen lemonade that everyone seems to enjoy. Ok, I'm done, how do you feel about chick-fil-a shakes? 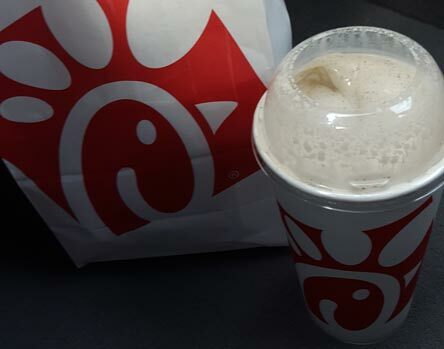 One of the best "shakes" at Chik Fil A is the frosted lemonade. Milkshakes - I love the cookies & cream shake you just tried, but if peppermint is still available you need to return ASAP for it. Hint: it's incredible if you have them mix peppermint and cookies & cream; I always ask for this and it's truly the best of both worlds. Other treats - I normally don't like lemonade... at all. However, their frosted lemonade (and especially their frosted coffee) are outstanding. They're not as thick (or caloric) as the shakes but they're very refreshing and sweet! Sounds like I'm getting a frosted lemonade and a grilled chicken wrap for lunch some day! I heartily recommend the Chick-fil-A Grilled Chicken Nuggets. They are cooked in a very flavorful, light marinade that coats the nuggets without overwhelming (but enhancing and complementing) the chicken taste - and you don't need a dipping sauce to enjoy them at all. Each nugget is bite sized, so a larger quantity size might be better, especially if you like them! Also - the sandwich buns are nothing special - but I always ask for a multi-grain bun when I order one of their sandwiches (you do have to ask for it, or they will give you the regular bun). The other comments about the frosted lemonade and frosted coffee are true - both are excellent! The lemonade has only three ingredients - fresh squeezed lemons, sugar and ice/water. Apparently each restaurant squeezes up to 1,500 lemons per day! Hope you tried and enjoyed both!